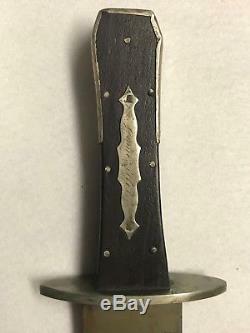 This most fearsome Bowie Knife was made for slashing out guts befopre, during and after the Civil war. This Coffin handle Bowie knife was called a widow maker: for good reason. This type of Bowie knife did indeed make many a woman windows. Overall - 18" Blade 12 3/4" X 2. Clip point blade made from a very good steel. If you run a wet stone over the cutting edge a few times, it will become very sharp. Handle is of a very hard wood, perhaps mesquite wood. Escutcheon plate is of sterling silver affixed to handle with two hand made square head tacks. Name is hand engraved in old script, but is worn a bit. Best I can make out is James Kelin? Top of coffin head is wrapped with a sterling silver wrap. Affixed to handle with four hand made square tacks. Handle has seven silver pins. Guard is of hand made German silver. No maker marks and has been just a bit over cleaned. Yes, even the down home red necks will be fast to recognize that my asking price is 100% giveaway!! 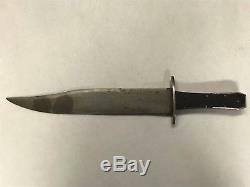 When have you ever seen a coffin handle Bowie knife for sale anywhere at this price? 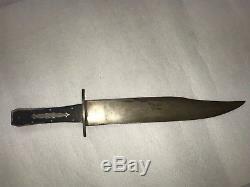 The item "Coffin Handle Bowie Knife-Civil War-Indian Wars" is in sale since Tuesday, April 03, 2018. This item is in the category "Collectibles\Militaria\Civil War (1861-65)\Original Period Items\Edged Weapons".